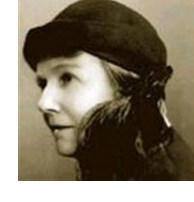 Mary Amelia St Clair Sinclair (1863–1946), who wrote as May Sinclair, produced two collections after the war that included stories that involved the supernatural: Uncanny Stories (London: Hutchinson, 1923) and The Intercessor, and Other Stories (London: Hutchinson, 1931). Her earliest fantastic story, however, was “The Flaw in the Crystal” (English Review September 1912), where Agatha Verrell invents a psychic transmitter for healing. In “The Finding of the Absolute” (in UC) Sinclair uses fantasy to express her own moral system: three people die—a philosopher, his wife and her love. In Heaven the philosopher finds that the other two have the task of introducing him to the afterlife. In “The Victim” (Criterion, October 1922) the expectations are reversed too: the ghost of a murdered man turns out to be grateful that he was killed. Sinclair was born near Birkenhead, Cheshire. Around 1870 her father, who ran a shipping business in Liverpool, went bankrupt. May lived in various places in the south of England as she grew up, and in 1881 was at Cheltenham Ladies’ College for a year. Her father (an alcoholic) died that same year, and before 1896 four of her brothers had all died of heart failure. Sinclair published her first book, Nakiketas and other Poems (1886) under the pseudonym Julian Sinclair. Essays in Verse (1892) was her first publication as May Sinclair. Sinclair published on philosophy too: her first essay on idealism was published in 1893. Her first novel, Audrey Craven, was published in 1897, at a time when Sinclair was looking after her mother in lodgings in Hampstead in a state of some despair, but her first successful novel was The Divine Fire (1904), a critique of the book selling industry. In 1905 her last surviving brother died, and she took responsibility for his children; and when the widow of another brother died in 1906, Sinclair took responsibility for those too. She was by then becoming a respected literary figure, and became friends with many of her colleagues, including several to be found on this website, such as Ford Madox Ford, Wyndham Lewis and H.G. Wells. In 1912 she wrote Feminism for the Women Writers’ Suffrage League; she was also a member of the more militant Women’s Freedom League. In October 1913 she attended the first meeting of the Medico-Psychological Clinic of London; she wrote their prospectus, and joined their board of management. The clinic introduced the new ideas of psychoanalysis to England (although that was only one of their techniques). In May 1914 she became a member of the Society for Psychical Research. Her actual war experiences lasted just two and a half weeks, technically; but the war dominated her publishing for his duration. In 1916 Sinclair became a fellow of the Royal Society of Literature, and was hailed by one (male) critic as “the foremost living writer among English-speaking women” (quoted in The Times, 15 Nov 1946). She published an article which made English readers aware of the schism between Freud and Jung. Two of her best-regarded novels were published after the war: Mary Olivier: a Life (1919) and The Life and Death of Harriett Frean (1922). Around 1920, symptoms of Parkinson’s disease appeared. She was looked after by Florence Bartrop from 1919 onwards, until the end of her life in 1946, first in Stow-on-the-Wold, then in Cornwall (next door to Dorothy Richardson), then in Stow again, and then in Buckinghamshire. The information is largely from Max Saunders’ entry in the Oxford Dictionary of National Biography, supplemented by Suzanne Raitt’s May Sinclair: A Modern Victorian (Oxford: Clarendon, 2000). The stories are discussed by Len Hatfield in E.F. Bleiler, ed., Supernatural Fiction Writers: Fantasy and Horror, Volume 1: Apuleius to May Sinclair (New York: Scribner’s, 1985), 513-519.